Feel Free To Call Us With Any Questions You May Have!! *I Return All Emails & Phone Calls Within 24 hours. If You Haven't Received A Response For An Email, Please Call Me!! Highborn Havanese are sold to select homes only. provide the best care for one of our puppies. caged or left alone for hours at a time on a consistent basis. These are indoor pets that cannot be left outside. There are many toy breeds that might fare better when left at home while their human works all day; however the Havanese is not that breed! I'm sure you've noticed, ALL of our dogs have great coats & clear eyes. 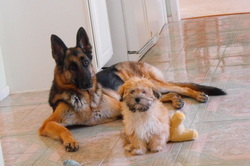 We began feeding all of our dogs (& our puppies) Life's Abundance Premium Dog Food. Never, in the past 15 years have all of my dogs been on the same food due to illness, age and dislike. Because of these factors, we have not been able to keep all of our dogs on one food. From the first day we tried Life's Abundance they all loved it! There are no more loose stools, dull coats or missing fur. ALL of my dogs & pups now have great coats, clear eyes and an over~all healthier appearance. Titan, always under-weight gained 8 lbs, Zeke stopped licking his fur and Flyer lost his arthritic limp!